Is This Intel Corporation Desktop Processor Rumor True? This Fool takes a look at whether the rumor that Intel is releasing its first 10-nanometer desktop processor in 2018 still makes sense in light of other leaked information. Back in early September, DigiTimes -- citing an Intel product road map that it apparently obtained -- said Intel (NASDAQ:INTC) intends to launch a processor known as Coffee Lake for the desktop market during the second half of 2017. DigiTimes also said those same product road maps indicated that the follow-on to Coffee Lake for desktop computers, known as Ice Lake, is expected to arrive in 2018. 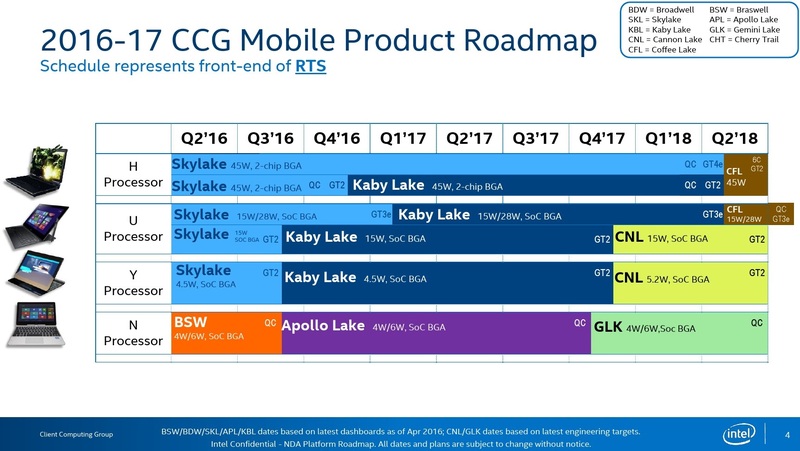 Considering some other leaks around Coffee Lake -- in particular, one leaked product road map that has been circulating the Web shows that Coffee Lake for notebook computers isn't expected to arrive until the second quarter of 2018 -- is it likely that DigiTimes' report is still accurate? Could Coffee Lake come sooner for desktops than for notebooks? The road map that DigiTimes references is apparently a desktop processor road map. In contrast, the road map that contradicts the one that the DigiTimes article was based upon was about processors intended for use in laptops. It is conceivable that Intel might be planning to launch Coffee Lake for desktop computers first and then release the versions aimed at notebooks later. However, it's important to keep in mind that the chips that go into desktops and the ones that go into notebooks are based on the same exact silicon, so it's not clear if that hypothesis will ultimately hold up. If Coffee Lake is delayed, does that push out Ice Lake? Coffee Lake is Intel's Cannon Lake architecture -- a modest enhancement to the current generation Skylake architecture that powered Intel's sixth-generation Core processors and recently announced seventh-generation Core processors. It's also built on a variant of Intel's 14-nanometer manufacturing technology. Ice Lake, on the other hand, is expected to represent a brand-new architecture. The chip is also likely to be manufactured in some variant of Intel's upcoming 10-nanometer process -- I would expect it to be the company's second generation 10-nanometer+ technology. Ice Lake is likely to offer a significant performance boost over Coffee Lake and be more power efficient to boot. Intel would certainly benefit from releasing Ice Lake as early as possible, as its personal-computer customers are likely to appreciate the added performance and features. Intel has cut product lines short in the past to bring out newer, better technologies, so if Ice Lake is ready for a launch in late 2018, I could see Intel going for it. However, Intel's execution when it comes to getting desktop processors out in a timely fashion still leaves much to be desired. Over the past several product generations, Intel has gotten chips out later than the company had previously expected, and the average time between two desktop processor generations is solidly north of a year. It would take some very good execution on Intel's part to keep Ice Lake on track for a 2018 launch, especially because Coffee Lake appears to have been delayed from the second half of 2017 to the first half of 2018. At this point, investors and consumers should just assume that Ice Lake for desktops will launch in 2019.